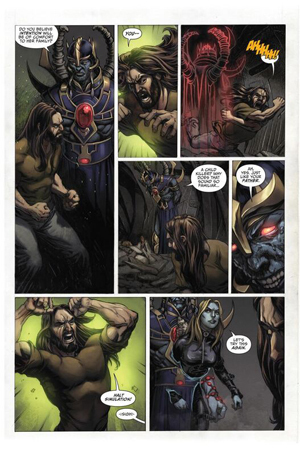 Issue one of Claudio Sanchez’s comic series/space odyssey, The Amory Wars: Good Apollo, I’m Burning Star IV was released today via Evil Ink Comics/Boom! Studios. The 12-issue sci-fi series is the 3rd in a line of comics that follow the story arc from Sanchez’s band, COHEED & CAMBRIA’s concept albums. 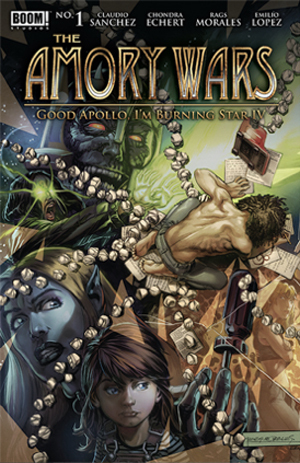 The new series loosely follows the lyrics and tone of their massive selling 2005 album, Good Apollo, I’m Burning Star IV: From Fear Through The Eyes Of Madness (Columbia), and elaborates on the graphic novel of the same name which was released as a companion piece to the album on it’s original release. Purchase the first issue now HERE. The story of Good Apollo flows around protagonist Claudio Kilgannon (son of COHEED & CAMBRIA) who until now has been mostly in hiding since the death of his parents; his advancing physical powers have drawn him out. It’s becoming clear to Kilgannon and those around him that the he is one mentioned in the prophecies, sent by God to destroy the universe he lives in because too many mistakes were made by the elite. But to Kilgannon, none of this makes any sense. Ambellina, the blue-skinned fallen Prise who’s mission it is to watch over him – helps guide him on the decisions he has in front of him. Evil Tri-Mage Wilhelm Ryan is out to stop Kilgannon, and imprison every last human living in Heaven’s fence, or worse, steal their souls. Good Apollo.. introduces a character that crosses the fictional plane of the series: the “Writing Writer” Ryder, the alleged creator of these worlds, whose heartbreak in life is beginning to affect the fictional story, and causing him to lose control of his characters to their own free will. COHEED & CAMBRIA have always done things in a grandiose way, and this time is no different. The comic release, though years in the making, drops the very same month they embark on the 6 week “Neverender GAIBSIV" tour, performing the progressive juggernaut of an album that inspired it, Good Apollo, I’m Burning Star IV, in its entirety across the US and Europe. They are also set to release the vinyl for the first time, which will include a Record Store Day exclusive color, a tour version, and a web exclusive version available April 28 via http://www.coheedandcambria.com/. The upcoming "Neverender GAIBSIV" tour will be supported by THE DEAR HUNTER, and will include performances at festivals including Welcome To Rockville, Las Rageous, Carolina Rebellion and Rock On The Range.